Queen's University is hoping a new £6m research venture will lead to super-fast computers which use light to process large amounts of data. The joint scheme with Imperial College London aims to establish a world-leading programme on the science of 'nanoplasmonic devices'. Queen's say the devices' key components are tiny metal structures that guide and direct light. The structures are more than 100 times smaller than the width of a human hair. Queen's say the structures have been tailor-made to "interact with light in an unusual and highly controlled way". This means they could one day be used to build new kinds of super-high-speed 'optical computers' - so named because they would process information using light signals, instead of electric currents. At present, the speed with which computers process information is limited by the time it takes for the information to be transferred between electronic components. This information is transferred using nanoscale metallic wires that transmit the signals as an electric current. 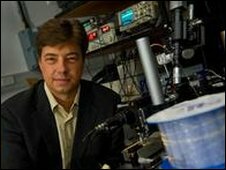 Professor Anatoly Zayats from the Queen's University's Centre for Nanostructured Media who leads the project said: "This is basic research into how light interacts with matter on the nanoscale. "But we will work together with and listen to our industrial partners to direct research in the direction that hopefully will lead to new improved products and services that everyone can buy from the shelf." Professor Stefan Maier, who leads the research team at Imperial added: "This is an exciting step towards developing computers that use light waves, not electrical current, to handle data and process information. "In the future these optical computers will provide us with more processing power and higher speed." The Engineering and Physical Sciences Research Council (EPSRC) is funding the two universities to establish the research programme.